This page is formatted for screen resolutions of 800x600 or greater. The quest to produce motion pictures in realistic colors began the instant that the first hand cranked cine camera turned. A variety of assorted methods achieved varying degrees of technical and commercial success prior to the introduction of three strip full color Technicolor® in 1934. The facts about the color image seen at left are muddied with the passage of time. In fact, they were muddied by 1925 when the film was described in a book entitled A Million And One Nights: a history of the motion picture through 1925 by Terry Ramsaye. Ramsaye goes into great detail explaining that the frame was part of a fifty second sequence shot by Urban and Smith in England in July, 1906 and was the birth of Kinemacolor, a successful two color process. However, the image was restored by me from a photo of a three color negative. Other sources state that the image dates back to 1901, which might be close to the truth. Urban and Smith began their research with three primary colors (red, blue, and yellow*), based on the work of Englishman Edward R. Turner, whose original British patent had been issued in 1899. The three color system was deemed virtually unworkable, and the registration in this photo would seem to bear that out. Following Turner's untimely death, Urban and Smith began work using two colors, blue-green and red-orange. As you can see, the color fidelity appears remarkably good, but the image suffers from extreme fringing. This tells us that the camera that took the picture did not expose all the color records simultaneously. Static items, such as the ladders and background are relatively free of artifacts. Moving objects, the two children and the swing, are fringed because movement takes place during the interval between successive exposures. Systems that used either multiple lenses to achieve simultaneous exposures or single lenses taking successive exposures will always suffer from fringes and/or parallax error. 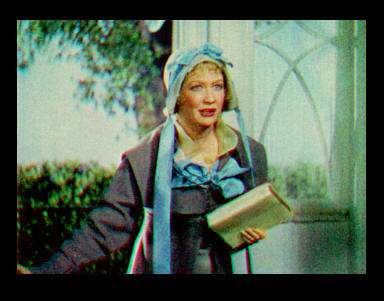 One of the reasons for the success of the early Technicolor systems was that they used single lenses and simultaneous exposures. Thanks to Jim Knuttel and Bob Birchard for identifying the actress and film. The earliest methods included hand painting individual frames, tinting the film stock, toning the black and white emulsion, and combinations of any of these. The results were frequently quite striking but not particularly realistic. The term natural color was used for films that more or less recorded their color from the subject being photographed, rather than having color arbitrarily added after prints were made. "Additive" means that the color elements are separate on the film but are overlapped and combined on the screen. 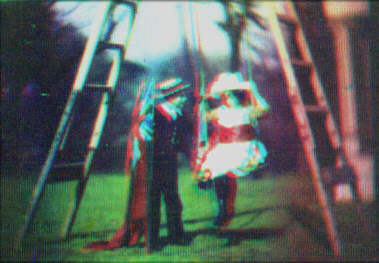 This type of film has complementary color dyes in its emulsion. The dye color subtracts its complementary color as light passes through it, allowing the correct color records to be projected. While more complex, subtractive color transmits a far greater amount of light than additive systems. There was a lot more than just Technicolor and Kinemacolor working to produce natural color films. This page presents you with a small list of some of the color companies/systems. Some were flops and others did a credible job. Do you have rare photos of early color processes that you'd like to see included in this page?